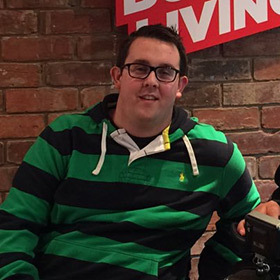 Kieran was injured in 2013 whilst playing in a pre-season game for Nantwich Rugby at age 21. A freak tackle accident left Kieran paralysed from the waist down. In October 2015, Kieran contacted the Foundation needing assistance in buying a chair specifically designed for playing wheelchair rugby. After meeting Matt and the team it was decided he fitted our ethos of Get Busy Living perfectly and the Foundation lent its help. In August of 2016 Kieran competed in a wheelchair rugby tournament that featured London 2012 GBWR Captain Steve Brown and many others. The Foundation is delighted to support someone with such a positive attitude and we look forward to hearing about more of Kieran’s successes in future.